Developers will add 6.2GW of new wind capacity in Saudi Arabia between 2019 and 2028 — 46% of the region’s 13.5GW total capacity additions in this period — according to Wood Mackenzie Power & Renewables. However, the country will fall short of the revised 16GW target under its Vision 2030 program — a package of economic, energy and public sector goals for Saudi Arabia to achieve by the end of the next decade. Elsewhere, against a backdrop of regional volatility, Wood Mackenzie expects an extra 2GW of new wind power installations online in the Middle East by 2021, 6GW by 2024, and 13.5GW by 2028. 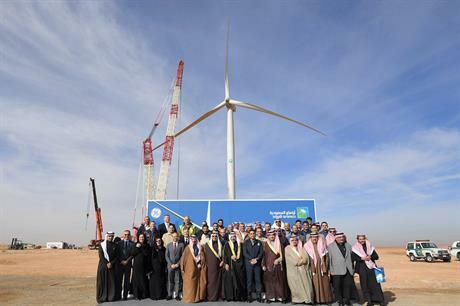 Saudi Arabia’s Renewable Energy Project Development Office (Repdo) is due to award 850MW of wind capacity this year, with the projects expected online between 2021 and 2022. It awarded the 400MW Dumat Al Jandal wind farm — due to be the country’s first commercial-scale project — to a consortium of French energy firm EDF and Middle Eastern developer Masdar last year, and announced the results this January. That same month, the government raised its 2030 wind power target. It had initially aimed for 9.5GW of wind and solar PV capacity by this date, but revised its ambition for these technologies to 16GW and 40GW respectively. Public Investment Fund (PIF), the Saudi sovereign wealth fund, will finance 70% of this new capacity, with Repdo supporting the remainder. Sohaib Malik, a senior analyst at Wood Mackenzie, said: "A central concern is the PIF’s lack of track record in the renewables sector and its limited in-house sectoral expertise. "Repdo, on the other hand, completed two renewables requests for proposals after pre-developing the sites." As well as the wind power tender won by EDF and Masdar, Repdo also awarded a 300MW solar PV project to Middle Eastern developer ACWA Power. Elsewhere, Wood Mackenzie expects volatility in the Middle Eastern wind market to remain. Following strong positive growth in 2018, project development is due to slow in Jordan (185MW last year) and Iran (63MW) this year, the analysts forecast. Lebanon is expected to award licences for between 200MW and 400MW of projects this year, adding to the 202MW it has already permitted. The region is due to add 2GW of new wind power capacity between 2019 and 2021, Wood Mackenzie forecasted, up from a combined total of 675MW today. Meanwhile, the outlook for solar PV is much more positive, reflecting the region’s "world class solar energy resources", Malik added. While 6GW of wind power capacity is expected to be added by 2024, 53GW of new solar PV is due online by this date. Wind power developers will increasingly struggle to compete against solar PV on price in low-wind markets such as Bahrain, Qatar and the United Arab Emirates, Malik said.